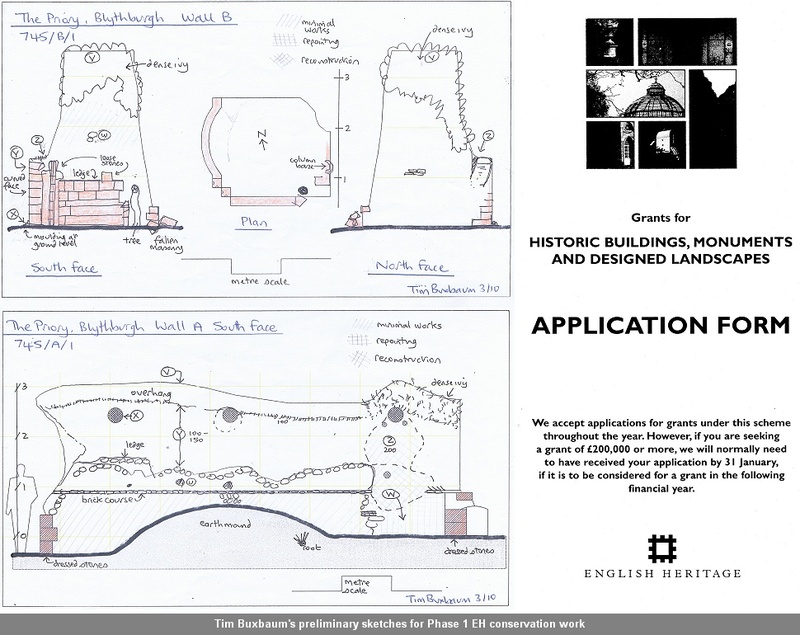 In November 2009, we met with John Ette, Ancient Monument Inspector and Rob Parkinson, English Heritage Architect and discussed ideas, not only to ‘hold the line’ of SAM SF215, but how to integrate this with an overall management plan for the site as a whole. Rob explained in detail the various aspects of site management, including surrounding tree works, rabbit protection, and of course the need for a project architect. After much consultation, deliberation and investigations into similar projects and sites, Chartered Architect Tim Buxbaum RIBA was appointed in December 2009 to steer the project forward. In tandem with Tim, who was preparing the schedule of works for the ruins, we made the necessary applications for recommended tree surgery works, and applications to complete the overall site management plan, including stores, workshop and allotment and parking areas.